Bronze Copper was described in 1775 by the Dutch naturalist Pieter Cramer, from a female specimen now lost. But the original watercolor drawings of Cramer’s type specimen were recently re-examined by John Calhoun, who deduces that the specimen was collected by a Thomas James around 1766, probably in Brooklyn, New York, on Long Island--- a habitat long since lost to urban sprawl (Calhoun 2010b). Bronze Copper remained uncommon to rare in the vicinity of New York City through the early 20th century, but has not been seen in that region since 1982 (Glassberg 1993). Bronze Copper's Massachusetts history is as elusive as the butterfly itself. There is nothing about the Bronze Copper in Thaddeus W. Harris’ writings. It is not on his list of insects collected around Boston between 1820 and 1850, but he did have one 1851 specimen in his collection from Keene, N. H. ("List;" Index). Thoreau, who walked Bronze Copper’s present-day haunts in the Concord area in the 1850s, does not mention it, although he did comment on the American Copper. Scudder in 1862 terms the species “quite rare” in New England, and it is not on his 1872 list of those “known to occur in Essex County.” He thought it was found mostly to the south and west of New England. But it was soon discovered in western Massachusetts, and by 1889 Scudder is able to list records from Amherst (Marsh); Mt. Tom (Morrison); Springfield (“not uncommon” according to Emery and Dimmock); Belchertown (A.C. Sprague); North Leverett (F. S. Sprague); Lenox (“common” according to Edwards); and Williamstown (“rather rare”) (Scudder 1889: 980). Today, the Harvard Museum of Comparative Zoology (MCZ) still has Morrison’s specimen from Mt. Tom (in the Scudder collection, no date); the female from North Leverett taken by F. H. Sprague 8/12/1878; and two specimens from Belchertown taken 8/30/1886 by A. C. Sprague. No other 19th or early 20th century Massachusetts specimens have been located in the MCZ. To Scudder’s knowledge at the turn of the century, Bronze Copper had “never been taken east of the Connecticut valley” (1889: 980). This assessment is so at variance with the species’ distribution today that it raises fascinating questions: Did the Bronze Copper migrate eastward only during the 20th century? Could it possibly have been overlooked before 1900 around Boston, or in the well-studied Sudbury River valley before 1970? Is its presence today in these areas, and on Plum Island and other locations in Essex County, a fairly recent phenomenon? The earliest record from east or central Massachusetts seems to be a specimen from Framingham taken by C. A. Frost, who collected between 1900 and 1916 (cited by Farquhar 1934; specimen location unknown). Thus, Bronze Copper may have expanded eastward shortly after Scudder wrote. The next reports come in the early twentieth-century from along the coast in Essex County. In 1924 at Salisbury, near the New Hampshire border, a Bronze Copper was captured September 6 by A. P. Morse of the Peabody Museum in Salem; he believed it to be “the first example recorded from the county.” It was a female in perfect condition found on goldenrod at the edge of the salt marsh. A male was also seen, but not collected. At about the same time, Austin H. Clark (1925: 293-8) reported a specimen from a marshy spot in Essex, caught by his son, Austin B. J. Clark (9/1923 female specimen now at Boston University). Fifty years later, in 1970, Bronze Copper was again collected on Plum Island by Paul Z. Goldstein (8/26/1970 male and female specimens in the MCZ), and the species still occurs sparingly in Essex County today (see below). 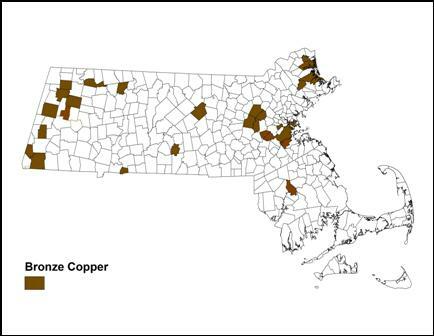 Did Bronze Copper, which has a generally northerly distribution, move south from New Hampshire into Essex County? Or did it migrate northeast along the Sudbury/Concord, and then Merrimack, river valleys? There are early 20th century New Hampshire specimens from Hanover and Bristol. There are apparently no reports from the Sudbury/Concord river drainage, or from Middlesex and Norfolk counties, until 1971. In August of that year, Paul Z. Goldstein found a specimen in Concord at Great Meadows NWR, and another in Dunstable, along the New Hampshire border (specimens in the MCZ). Then in 1974 Darryl Willis found Bronze Copper in the Holliston-Framingham area (Lep.Soc.Seas.Sum 1974), and William D. Winter collected several specimens from Dover on 6/22/1974 (specimens in the MCZ). Winter also collected three specimens from Barre (Worcester Co.) on 7/8/1972 (MCZ), and two males were reported in 1975 from Charlemont (Franklin Co.) by G. Morrell (Lep.Soc.Seas.Sum. 1975). Another tantalizing historical question: did the Bronze Copper die out in the central Connecticut River valley, where it was known in the nineteenth century? It has not been found there today. Map 15 below gives the present-day distribution 1992-2013. Bronze Copper is a wet meadow species, frequenting “the springy margins of brooks” (Scudder 1889). Floodplains along the Sudbury, Concord, Ipswich, and Connecticut rivers are typical habitats today in Massachusetts. Bronze Copper probably benefited from pre-industrial agriculture in New England, in areas where light grazing or shifting cultivation kept wet meadows open, encouraging the growth of dock (which cows do not eat) and polygonums (Table 1). But its rarity here historically makes this difficult to demonstrate. Bronze Copper’s native host plants are great water dock (Rumex orbiculatus), and swamp or water dock (Rumex verticillatus). In Massachusetts, R. orbiculatus is native to and found in every county of the state except Franklin, and R. verticillatus is native to five counties, though today is quite rare and a threatened species (Sorrie and Somers, 1999; Magee and Ahles 1999). 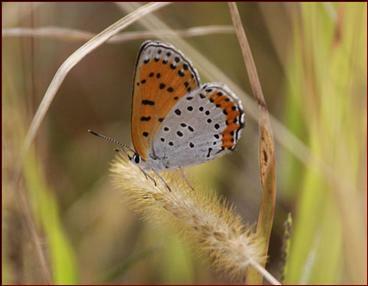 In Ohio, Bronze Coppers have been found and reared on R. orbiculatus (Iftner et al. 1992). Bronze Coppers are also reported to use native Polygonum amphibium [=coccinium] (Scott 1986) and Polygonum natans (MacLean 1990), Erect and Floating Water Smartweeds, both of which also occur throughout Massachusetts, as do other possible native and non-native hosts among the Polygonaceae (Magee & Ahles 1999; Sorrie and Somers 1999). The older literature is less definite about Polygonum use, but MacLean observed both larvae and pupae on P. natans in Minnesota. In Maine, P. deMaynadier has observed Bronze Coppers ovipositing on Polygonum amphibium in a large riverside sedge meadow in Passadumkeag Twp. ; the plant species was confirmed by a botanist (pers. comm. 9/14/2012). Bronze Copper’s main host today throughout its range is the widespread non-native weed curly dock (Rumex crispus)---another example of a native butterfly adopting a non-native host (See Table 3 "Switchers"). Bronze Coppers have been photographed and reared on curly dock in Massachusetts by M. Rainey, whose photo series at http://www.flickr.com/photos/mcrainey/sets/72157626689740307/ presents all stages of Bronze Copper's life cycle. It has also been photographed on dock in West Virginia (Allen 1997: Pl. 33), and reared on it in the lab in Connecticut (O’Donnell et al. 2007). Bronze Copper uses curly dock in the wild in Wayland, Massachusetts, as documented photographically by M. Rainey (Massachusetts Butterflies 35: 16-17, Fall 2010); in addition, MBC members S. Moore and E. Nielsen have on separate occasions observed ovipositing on curly dock, on the underside of leaves very close to the ground (presumably helping the egg overwinter) in Wayland and Sudbury. Polygonum may also be a larval host in Massachusetts. Sight reports of ovipositing on polygonum come from Sedge Meadow Conservation Area in Wayland (M. Arey, 9-12-2010), and Wenham Canal, Wenham (A. Grkovich, 8-31-2002), but we still need photographic evidence of ovipositing and larvae. Polygonum amphibium is certainly an important nectar source for Bronze Coppers; photographic evidence by G. Dysart from the Sudbury area can be seen at (http://dysart.zenfolio.com/bronzecoppers/e42a9cf14) (9-12-2012). And there are many reports of Bronze Copper "in association with" Polygonum spp. (probably P. amphibium) (e.g. M. Faherty, Ipswich River WS 9-12-2012). Grass-leaved goldenrod and asters are other favored nectar sources for this butterfly. As many authors have remarked, it is curious that Bronze Copper is thought to be rare or declining in the eastern United States, given the abundance of both curly dock and polygonums. There may be aspects of its biology and habitat needs which are not well understood, or climate warming might be having an adverse effect. Today this species is probably less rare in Massachusetts than in Scudder’s time. The MAS Atlas found Bronze Copper in only 10 of the 723 blocks searched, making it “Rare.” By contrast MBC record totals from the 2000s yield a ranking of Uncommon rather than Rare (Table 5). MBC numbers reflect sustained search efforts and the discovery and informal monitoring of some previously unknown occurrences, for example at Wayland Community Gardens and Wayland Sedge Meadow Conservation Area. Still, there may have been some actual increase in numbers of this species over this time period; list-length analysis of MBC data 1992-2010 indicates an approximately 400% increase in this species' detectibility in these years (Breed et al. 2012). The sighting increase seen in Chart 15 should not be taken to indicate any underlying population trend, because the majority of post-2001 MBC trips reporting this species were targeted trips, to the specific areas where this species is found, and the effort put in to find this species increased over time. Both Chart 15 and MBC unadjusted totals of individuals seen each year (chart not shown) show a marked increase in Bronze Coppers between 2002 and 2007, which may be mainly a result of the greater effort put in to find this species, and the discovery of new locations. What is more worrisome is that the Club effort did not decrease after 2007, but the numbers seen did, suggesting a real decline 2007-2009. Very few individuals, usually singles, were reported 1990 – 2002. After that, known locations in Wayland and Concord were searched in multiple visits every year, and some previously unknown locations in these and other towns were found. An annual club trip to the Wayland area was held each year 2001-2010, with multiple pre-trip trips. The high counts on some of these trips are noted below. Numbers at known locations seem to have declined in 2008 and 2009. In 2007, the average number of Bronze Coppers per report of that species had increased 159% relative to the average for the preceding years back to 1994. The number of reports of this species, and the maximum number reported, also increased in 2007 relative to prior years. However, in 2008 and 2009, the average number per report decreased relative to the average for preceding years (Nielsen, Season Summary, MB 2008-2010, Nos. 30, 32, 34). The 1986-90 MAS Atlas found Bronze Coppers only in or near the Sudbury River drainage (Concord, Sudbury, Millis), and in Essex County (Ipswich, Newburyport (Plum Island), West Newbury). There was one record from western Massachusetts (Pittsfield) and one from central (West Boylston). None were found in southeastern Massachusetts or in the Connecticut River valley. Map 15 from MBC records 1992-2013 confirms and expands the Atlas distribution, and in particular shows Bronze Copper to be much more widespread in the Berkshires than had been thought. Singles have been found in Egremont, Hinsdale, Stockbridge, Cheshire, and Windsor, and also possibly Sheffield, Pittsfield, and Adams, judging from the NABA count reports. Bronze Copper has been found in nearby Charlemont (Franklin County), and in the upper (Greenfield), and the lower (Longmeadow) -- but not the central -- parts of the Connecticut River valley. Bronze Copper is not common in central Massachusetts: singles have been found in only two towns, Princeton (1995) and Brookfield (1998). But in the greater Boston area, the strongholds in Concord, Wayland and Lincoln remain, and there are now several reports from Boston’s newly-created habitat at Millennium Park (2008; 2010), and Needham Charles River Preserve (2012; 2013), along the Charles River. In Norwood/Milton, Glassberg (1989:34) listed Fowl Meadow as an active location, but there have been only two recent reports (M. Arey, 2009 and 2010). In Essex County, Bronze Copper has been reported only once from Plum Island NWR (R. Hildreth, 3 individuals, 9/14/2003), but good searches of Plum Island have not been made since. Singles were found in 2008 and 2009 in a Newbury yard near Plum Island. Bronze Copper was reported in three years (2002, 2003, and 2012) at Ipswich River WS in Topsfield, around polygonum at the edges of the Ipswich River. In 2009, 2010, 2011, 2012 and 2013 Bronze Copper was found at Appleton Farms in Ipswich, where it was documented photographically in 2011 by Howard Hoople (see http://www.flickr.com/photos/hghoople/6201148117/ taken Oct 1, 2011), with larger numbers reported from that site in 2012 and 2013. In sum, Bronze Copper seems established, but rather scarce, in Essex County. In 2013 Bronze Copper was found for the first time in southeastern Massachusetts, in Raynham, in the headwaters area of the Taunton River drainage (1, 9/7/2013, M. Arey; 1, 9/19/2013, J. Dwelly). Prior to this, there had been no MBC, Atlas, or historical records from southeastern Massachusetts, so this may be a recent colonisation. Mello and Hansen (2004) do not list Bronze Copper for Cape Cod, and it is not found today on the Vineyard (Pelikan 2002) or Nantucket (LoPresti 2011). Nor was it on these islands in the 1940's, although it may have been present on one or both of the islands prior to 1900 (Jones and Kimball 1943: 197, citing the pre-1900 Bolter collection). In the years 2008-2013, Bronze Copper was found in the following river drainages (watersheds): Sudbury/Concord, Charles River, Taunton River, Ipswich River, Parker River, lower Connecticut River, and Housatonic River. Other notable recent locations are Longmeadow, Fannie Stebbins WS, 3 on 9/11/2013, J. Lambdin, photos on Facebook; Egremont, Jug End Preserve, 1, 8/16/2013, S. Shelasky, photo posted on masslep; and Needham Charles River Preserve TTOR, 2, 6/15/2012, R Hopping and 2, 9/18/2013, G Dysart, photos on Zenfolio. COLLECTORS PLEASE NOTE: BECAUSE OF THE CONTEXT OF REGIONAL DECLINE, WE RECOMMEND THAT specimens OF THIS SPECIES NOT be collected without a permit SPECIFYING THE INSTITUTIONAL AUSPICES AND purpose of THE research, and the LOCATION where the specimen(s) are to be deposited. MBC records show two flight periods: a small flight mid-June to mid-July, and a larger flight mid-August to mid-October (http://www.naba.org/chapters/nabambc/flight-dates-chart.asp). There are undoubtedly at least two broods here, as in Connecticut (O’Donnell et al., 2007). In Ohio, Pennsylvania and Maryland, there is a partial or full third flight (Iftner et al. 1992; Opler and Krizek 1984). Earliest Sightings: For the period 1992-2013, the five earliest MBC sighting dates are 6/6/2013 Concord Great Meadows NWR, T. Murray; 6/7/2009 Concord Great Meadows NWR, S. Jaffe; 6/8/2010 Ipswich Appleton Farms, H. Hoople; 6/9/1995 Charlemont, D. Potter; and 6/12/2008 Boston Millennium Park, B. Bowker. The second flight begins about mid-August; for example in 2013 fresh butterflies were found on 8/16 in Egremont (S. Shelasky), and 8/18 in Wayland (C. Willis). And in 2010 fresh males were found on 8/7 at Longmeadow Fannie Stebbins WS, and on 8/21 at both Milton Fowl Meadows and Wayland Sedge Meadows (M. Arey). But the numbers flying do not become very numerous until September. Latest Sightings: The four latest sightings in this period are 10/21/2007 Wayland Community Gardens, J. Forbes; 10/19/2006 Concord Nine Acre Corner, T. Whelan; 10/13/2003 Wayland Community Gardens, E. Nielsen; and 10/11/2013, Wellesley, G. Dysart. The extreme dates reported during the Atlas period are similar ---15 June and 21 October 1990, Concord (Middlesex Co.), R. Walton. There is not enough data available to suggest any trend toward earlier emergences or later flight dates. We believe that this species should be a conservation priority in Massachusetts given the regional context of decline. (See Species of Conservation Concern) The status of Bronze Copper in the northeast has been uncertain for some time. In Connecticut it is a state species of special concern, rank S2. The 1995-99 Connecticut Atlas found it local and rare, with only 12 project specimens compared to 31 pre-project. It is thought to be declining due to loss of pastures and wet meadows through development or succession. The species has especially declined in New Jersey (Gochfeld and Burger 1997:146-7). In 2002 New Jersey adopted a list of Endangered, Threatened and Special Concern species of butterflies, with Bronze Copper listed as Endangered. But after an absence of sightings since 1996, a few were seen in 2007 and 2008 (Wander and Wander 2009). Bronze Copper is a northerly species, which ranges across Canada, but south only to Maryland on the east coast of North America. It may be negatively impacted by climate warming (Table 6). Bronze Copper should benefit from the preservation of sedgy wet meadow habitat, kept open through light grazing or occasional mowing. Several writers have noted that it apparently tolerates some degree of disturbance in wet meadows; for example in northern New Jersey it been found in agricultural upland areas within the floodplains of larger streams (Gochfeld/Burger 1997; Wander and Wander 2009). At Appleton Farms in Ipswich Massachusetts it has been found in conjunction with moderately grazed wet meadows. Coexistence with low-impact, non-industrial agriculture may be possible. The core Massachusetts populations in Wayland, Concord and Sudbury are in large sedge-dominated meadows, but are by no means secure. Great Meadows National Wildlife Refuge in these towns protects some Bronze Copper habitat, but not the largest concentrations. Key populations are on land which might seem to be protected, since it is town-owned, but in reality is subject to many pressures. For example, in a move which outraged many butterfly enthusiasts, the town of Wayland in 2012 allowed farmers to plow up the Sedge Meadow Conservation Area to grow corn. Bronze Coppers at this critical site survived in reduced numbers only because one strip was left unplowed for "wildlife." In another example of threats to this butterfly, the Bronze Copper habitat on private property at Nine Acre Corner in Concord is periodically mowed and used as parking for golf tournaments. Overall, the NatureServe (2012) ranking for Bronze Copper in Massachusetts is S2-S3: between “imperiled” and “vulnerable.” More effort needs to be made to monitor and protect this species in this state.